When you want clearer skin that will leave you feeling like you’ve found the fountain of youth, try photo rejuvenation from Maryland’s Top Rated Local ® skin care facility! Whether your skin is suffering from sun damage, brown spots, dilated or broken veins, or even a skin condition such as Rosacea, photo rejuvenation can revitalize your skin. Intense pulsed light, or IPL, is the process we use for photo rejuvenation. The light, which includes both infrared and visible spectrums, helps your skin generate new cells after exposing your skin to the pulses of light which also generates heat. The process is widely used and considered extremely safe and effective. The result is clearer, rejuvenated skin that will leave you feeling and looking younger. Photo rejuvenation is a process rooted in science. Although it may seem that the treatment is only cosmetic, the use of IPL as a treatment for many skin conditions is recognized as effective. 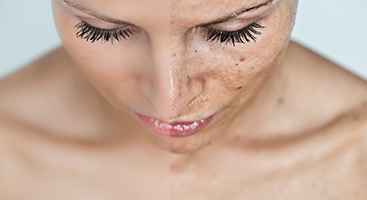 Photo rejuvenation methods have been shown to be effective in treating, among others, Rosacea, melasma, sun spots, dilated or broken veins, hyperpigmentation, and acne. If you are ready for your skin to look clearer and feel younger, schedule a photo rejuvenation appointment online, or call Rejuvenation Medi-Spa today at 443-291-7302 to book your appointment at either of our Maryland locations in Prince Frederick or La Plata. Don’t forget to check out our monthly medspa treatment promotions to see how you can save on photo rejuvenation today!